Whenever there is a book I haven't read and everyone is talking about, I search high and low until I find it. Such is the case with Lily of The Nile, a historical novel about Cleopatra's daughter, by Stephanie Dray. I read the book in two days and loved it. 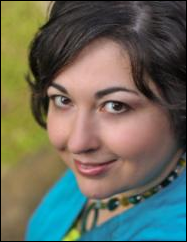 I caught up with Stephanie Dray to ask her a few questions about the novel. You were a lawyer, a game designer, and then a teacher before writing. Why so many different careers? I always wanted to be a writer, but I was well-aware of how impractical a career choice it really was. I tried to be responsible and do what was expected to make myself a productive member of society, but eventually the siren song of living a thoroughly dissolute life was just too loud to resist. So, our readers would love to know ... what's a typical day in the life of Stephanie Dray like? I'm generally awakened by my furry alarm clock, my cat, Butterscotch. After a few morning snuggles, we get up and make some tea. Then I pad over to my desk with the full intention of banging out several thousand words on my latest novel, only to be completely side-tracked by whatever emergency has cropped up in my inbox. I've recently realized that just because someone emails me doesn't mean I have to stop everything I'm doing right that moment and reply. I've made a new rule that I can only check my email three times a day. First thing in the morning, once in the afternoon, and again before bed. I've started getting a lot more done! I generally work until it's time to go to bed. I know that sounds crazy, but it's true. I might take a break to make dinner or watch some very bad television program with my husband, but the life of a fledgling author is pretty much a 12-14 hour day, every single day of the week. One might think I'd have accomplished a lot more, but I'm a painfully slow writer. In today's world, where the majority of books have supernatural creatures, what made you choose historical fiction to write about? Sometimes true stories are so amazing that they read like magic! I've always loved Cleopatra VII of Egypt - the most enduring feminine and feminist icon in the history of the world. When I realized that she'd had a daughter who also went on to win over Augustus and rule as a queen in her own right, I had to know more. 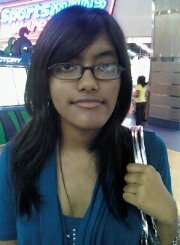 Here she was, a little orphaned girl, who grew up in the dysfunctional family of the very man who destroyed her parents and brothers. That she would go on to be one of his favorites, learning to flatter and please him, all while struggling to honor and preserve her mother's legacy - that's something that truly moved me. One of the statues that was found from Selene's reign was of a young priest of Ptah who died just before the fall of Alexandria. This young man, Petubastes, may have been Selene's cousin. Or perhaps he was simply a favorite companion of hers when she was a child. When I realized this, I got a little weepy, because it told me that this was a woman who forgot nothing ... she spent her whole life trying to honor her dead. That I have the opportunity to try to give her a voice through my writing is a gift to me. Of course, I do write about supernatural creatures too. I just do it under a pen name. 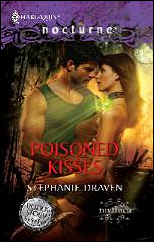 Yes, you also write under a pseudonym - Stephanie Draven. Why? Why not write all your novels under one name? People's expectations of authors can influence how they feel about their books. For example, people who love paranormal romance may not love historical fiction, and those readers who do enjoy historical fiction might look down on paranormal romance as not being serious enough. It's best to clue in your reader what to expect. On the other hand, the decision was largely determined by the way the market currently works. I didn't want the number of paranormal romance books that bookstores ordered to depend upon how many of my historicals sold or vice versa. It's really an archaic system at work, so having two names is supposedly a good idea. All I know is that it has kind of fractured my personality. As my serious, scholarly, feminist self, I blog as Stephanie Dray and tweet as stephaniehdray. When I'm wanting to show my sensual or bawdy or irreverent side, I tweet as stephaniedraven. Can you relate to Selene in any way? Like Selene, I come from a long line of strong-willed women who worked very hard to make opportunities for me. (Which I've largely squandered, I might add.) My debt to my family, my sense of obligation, and my abject fear that I'll never measure up is probably something that Selene and I share in common. Also, I identify with her because she's not a perfect little Mary Sue character. Selene has flaws and doubts and crises of faith. While I've been blessed with almost universally great reviews, every now and then someone will say that they don't like her. I always think - do you have to like her? We don't even always like ourselves, do we? Who are your writing inspirations? I have so many that I fear to start naming them, for fear of leaving anyone out. I'll just say that I tend to really respect authors who don't wait around for their muse - who respect writing as a business and as work. 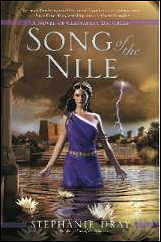 As a historical novel, Lily of the Nile obviously has several historical elements in it. What research did you do for your book? I read every book in existence on Cleopatra Selene, and probably on her mother, too. Then Augustus, Juba and all the figures in Selene's life. Though I wasn't able to visit Rome again for research, I was there when I was eleven years old - the same age Selene was when she first arrived - and I have quite vivid memories. I immersed myself in reproduction of ancient music, re-read the classics, like Virgil's Aeneid, and sent obnoxious letters filled with questions to experts in the field. 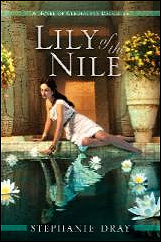 What inspired you to write Lily of the Nile? I wanted to write about her because historians typically overlook Selene. I find this surprising because she and Juba would have played a significant role in securing the peace in North Africa and providing the grain that would help realize Augustus' Pax Romana, the hundred years of relative peace and prosperity in the Roman empire. Moreover, she's a significant figure in the history of female-centric religions because although Isis would go on to dominate the Roman world, during Selene's lifetime, the religion was deeply out of favor with Augustus. It's well-documented that Agrippa was even obliged to return from the East to help put down Isiac unrest. And yet, Selene would continue to be the most prominent figure in the religion, which she never renounced. I think folks should know about that. Readers telling me how much they love my books! Any tips for aspiring writers like myself? Figure out who you are as a writer and what you can stand writing over and over again. As artists, we have all kinds of ideas and we want to write all sorts of genres. But when you're published, you'll need to establish a brand for yourself. You'll be asked to write similar things for a while. Be sure that you know what it is that you can stand to be known for, rather than just being glad you got published at all.